We covered ways to make an impression with exhibition graphics in our previous post so we know its tough to create an impact. Its why we continually develop new systems and search for fresh options to get your message noticed. Its what we do to keep us (and you) ahead of the curve. Its also why, when we spot something a little different, we’re all over it! Now, it may come as a surprise but we know a little about roller banners. We know which ones work for what purpose and which are more reliable and which are the best at each price point. What we also know is that sourcing something really unique in today’s roller banner marketplace is pretty hard to find. That’s why, when we set eyes on our new LED Scroller Banner, we knew that sometimes a product that’s really innovative does pop up. Our R&D people with their white coats and clipboards have been testing it out for a while. They’ve been pulling it, pushing it, and generally putting it through its paces. Once they gave us the nod, we knew it was ready to make its first appearance in our online store. Our Scroller Banner product page has all the info, but I’ll cover the main points here as well while I’ve got your attention. It’s no bigger than a regular roller banner so it’s still incredibly portable and easily carried around. In fact, the main difference to a standard unit is that it needs power for the LED screen. It’s a 3 pin plug so no hassle. 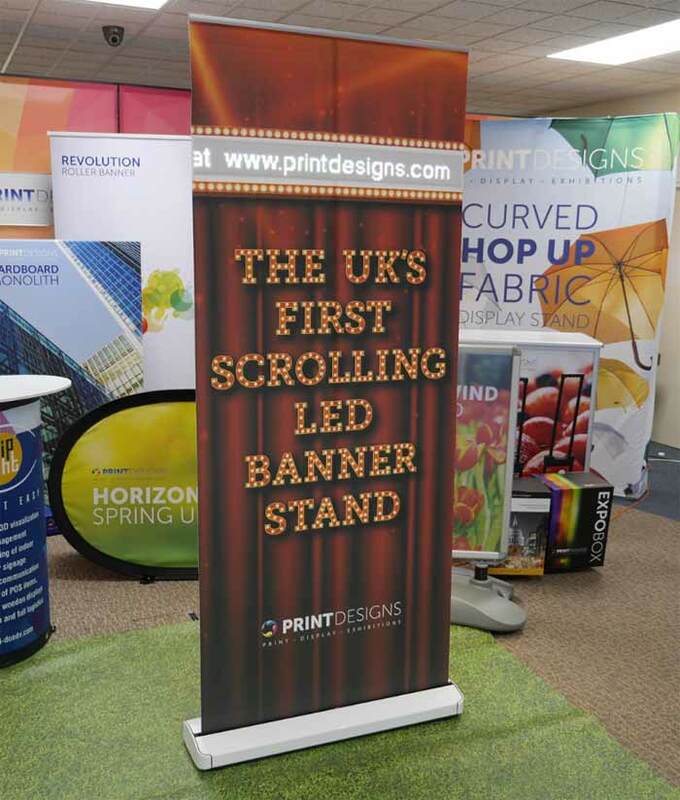 Plus, instead of the graphic being printed on a textured film, the Scroller Banner uses a creaseproof and durable polyester fabric. Punchy and vivid, your image will be almost as bright as the LED screen itself! By using a fabric, we’ve incorporated a pocket where the LED screen simply slides into. After the stand is in place and upright, the intelligent LED panel slips into the sleeve ready for action. Its also worth knowing that we can produce additional polyester printed panels should you need to cover different events or applications. To get your information up in lights, there’s an Android app that beams the info directly to the screen via Bluetooth. One touch and the LED’s message is completely personalised. There is even a setting for the font type and scroll speed. Offices and meeting rooms – guests being immediately acknowledged with their name on the screen. Events – as a programmable wayfinding solution, it can’t be beaten. Retail – how about today’s specials or offers changed daily with the flick of a phone screen? Simple yet remarkably effective. In fact, it’ll fit anywhere you’d use a regular roller banner. 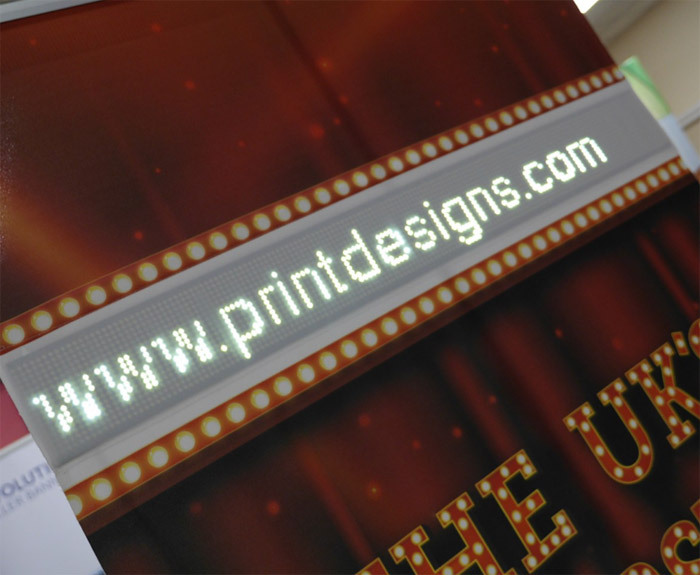 An LED Scroller Banner will just catch so many more people’s attention as they walk past. 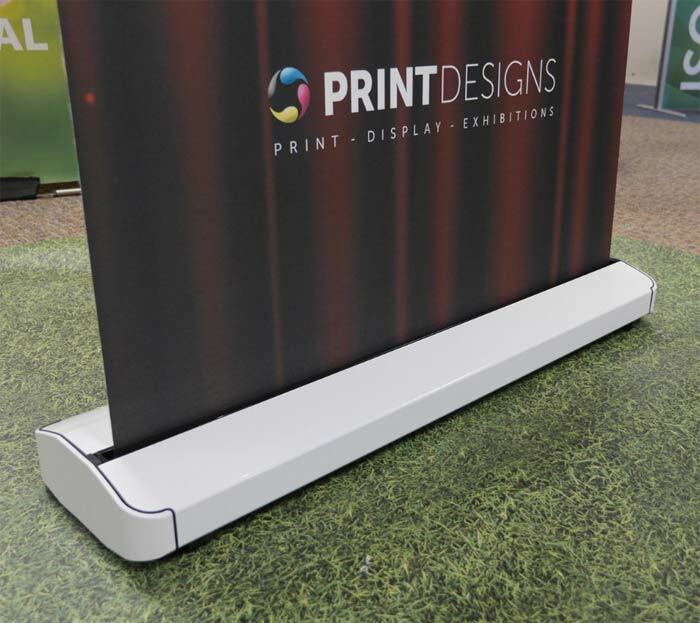 If your displays are just not getting the attention they deserve, turbocharge your banner stands with the all-new LED Scroller from Printdesigns. Full product information and to order click here.